SEO Note 1.3.25 is pims & calendars software developed by SEONote.info. 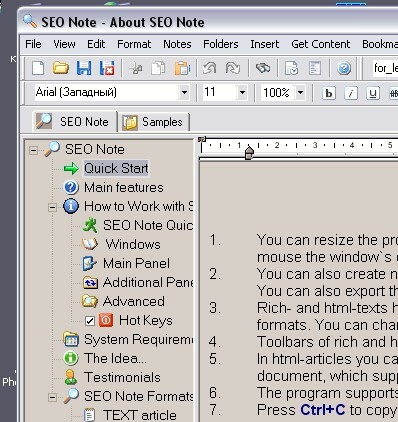 SEO Note is one of the best freeware personal and business information managers for Microsoft Windows XP, 2000, NT, 98 and 95 systems. Save and organize all your personal and business notes in a single file and make your life easier. Save time searching for phone numbers, names, plans and ideas! This pims & calendars software is freeware, which means you can download and use SEO Note 1.3.25 absolutely free. There's no need to buy the product. SEO Note 1.3.25 supports different languages (including English). It works with Windows XP/Vista. Latest SEO Note 1.3.25 does not contain any spyware and/or advertise modules, allowing installing it with no worries concerning valuable information loss. Our website has thoroughly tested business product SEO Note 1.3.25, written the review and uploaded installation file (2306K) to our fast server. Downloading SEO Note 1.3.25 will take minute if you use fast ADSL connection.